It is well known, at least among tomographers, that our images of the Earth's interior are washed out. Lateral variations in seismic velocities are likely to be weaker in our models than in the actual Earth due to explicit and implicit regularization needed to obtain a solution to our mixed-determined inverse problems. As a result, obtaining reliable estimates of the amplitude of velocity variations is difficult, and the inferences we make about temperature and composition variations based on these estimates may be questionable. By using a transdimensional Bayesian inversion of P wave travel-times -- in which the model space is explored using a reversible jump Markov Chain Monte Carlo algorithm -- we have created 3D tomographic models beneath North America without using any explicit smoothing or damping (Burdick_Lekic_2017). The models we obtain allow us to quantify the uncertainty and trade-offs among velocities at different locations, providing much-needed error estimates. 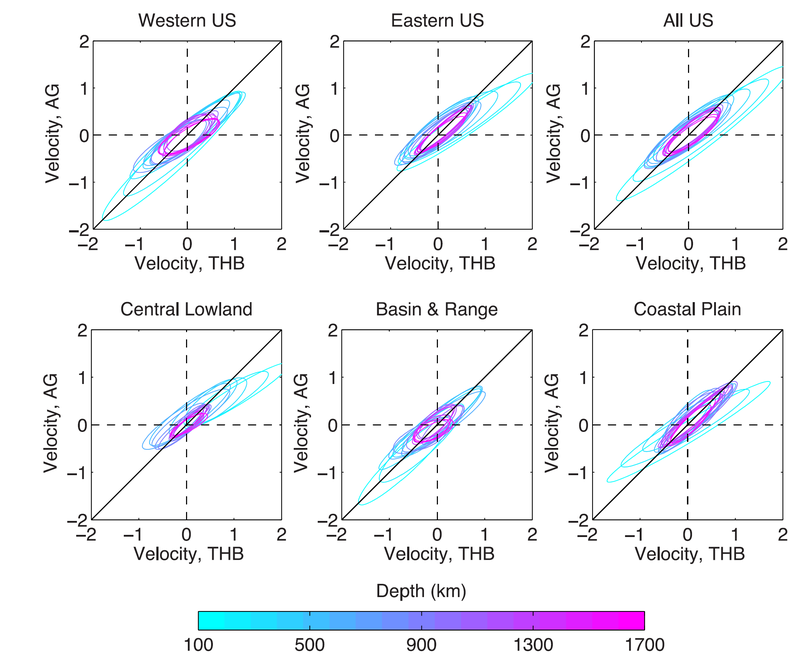 The models consistently have higher overall amplitudes than the model constructed with a traditional approach, revealing heterogeneity 10–80% greater at shallow depths beneath some eastern provinces. This difference in amplitude recovery is comparable to that attributed to the use of finite-frequency kernels (∼30–50%; Montelli et al. 2004) and accurate forward modelling techniques (∼50%, Lekic & Romanowicz 2011). The higher amplitudes recovered in these new models indicate larger variations in temperature than would be inferred from traditional damped inversion. As a worst case but realistic scenario, damping could cause the temperature difference between the subcratonic and average mantle to be underestimated by ∼100 ◦C. Therefore, our new model of the mantle beneath North America gives evidence of a wider degree of variation in temperature, and thus in buoyancy and viscosity for mantle structures, the implications of which we hope will motivate study by geodynamicists and geochemists. In the image above, confidence ellipses represent 95% confidence regions (2.45σ) of velocity correlations between the new models (THB) and standard, damped inversion (AG). The tilt of the ellipses shows that velocity variations in the new models have higher amplitude in general, particularly at shallow depths and in the Eastern US, where there is a factor of ≈1.5 between them. Note that the tilt of the ellipses is dependent on regularization choices in the damped inversion.